The Seven Sayings of the Saviour on the Cross, Dr. 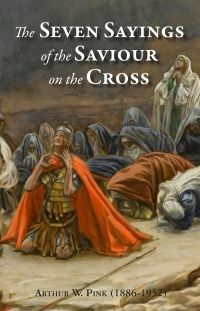 Pink illustrates clearly the lessons that emerge out of the seven utterances of Christ on the cross, filling the reader with the glory of the redemptive message. Pink uses one chapter, for each of the seven things Jesus said while dying: the word of Forgiveness (Luke 23:34), the word of Salvation (Luke 23:42-43), the word of Affection (John 19:25-27), the word of Anguish (Matthew 27:46), the word of Suffering (John 19:28), the word of Victory (John 19:30) and the word of Contentment (Luke 23:46). Each of the seven chapters is then broken down into seven profound insights on what Jesus said, why he said it, and the far reaching implications for us who hear it. Dr. Arthur W. Pink (1886-1952) served as a pastor for churches in Colorado, California, Kentucky, and South Carolina. His ministry brought him throughout the United States, Australia, and Great Britain. 1. Here we see the fulfillment of the prophetic word. 2. Here we see Christ identified with His people. 3. Here we see the divine estimate of sin and its consequent guilt. 4. Here we see the blindness of the human heart. 5. Here we see a lovely exemplification of His own teaching. 6. Here we see man’s great and primary need. 7. Here we see the triumph of redeeming love. 1. Here we see a representative sinner. 2. Here we see that man has to come to the end of himself before he can be saved. 3. Here we see the meaning of repentance and faith. 4. Here we see a marvelous case of spiritual illumination. 5. Here we see the Saviourhood of Christ. 6. Here we see the destination of the saved at death. 7. Here we see the longing of the Saviour for fellowship. 1. Here we see the fulfillment of Simeon’s prophecy. 2. Here we see the perfect man setting an example for children to honor their parents. 3. Here we see that John had returned to the Saviour’s side. 4. Here we discover an illustration of Christ’s prudence. 5. Here we see that spiritual relationships must not ignore the responsibilities of nature. 6. Here we see a universal need exemplified. 7. Here we see the marvelous blending of Christ’s perfections. 1. Here we see the awfulness of sin and the character of its wages. 2. Here we see the absolute holiness and inflexible justice of God. 3. Here we see the explanation of Gethsemane. 4. Here we see the Saviour’s unswerving fidelity to God. 5. Here we may see the basis of our salvation. 6. Here we see the supreme evidence of Christ’s love for us. 1. Here we have an evidence of Christ’s humanity. 2. Here we see the intensity of Christ’s sufferings. 3. Here we see our Lord’s deep reverence for the Scriptures. 4. Here we see the Saviour’s submission to the Father’s will. 5. Here we see how Christ can sympathize with His suffering people. 6. Here we see the expression of a universal need. 7. Here we see the enunciation of an abiding principle. 1. Here we see the accomplished fulfillment of all the prophecies which had been written of Him ere He should die. 2. Here we see the completion of His sufferings. 3. Here we see the goal of the incarnation is reached. 4. Here we see the accomplishment of the Atonement. 5. Here we see the end of our sins. 6. Here we see the fulfillment of the Law’s requirements. 7. Here we see the destruction of Satan’s power. 1. Here we see the Saviour back again in communion with the Father. 2. Here we see a designed contrast. 3. Here we see Christ’s perfect yieldedness to God. 4. Here we see the absolute uniqueness of the Saviour. 5. Here we see the place of eternal security. 6. Here we see the blessedness of communion with God. 7. Here we see the heart’s true haven.